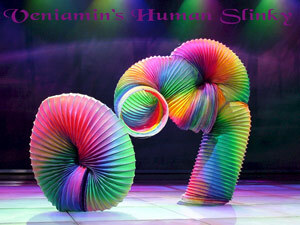 Receive more info about booking "Veniamin's Human Slinky" for your event! Remember how the undulating coils of a slinky would slip from hand to hand? "The human slinky, Veniamin, is a colorful and comical high-energy illusion. Adults may try to visualize exactly where he is inside the costume; kids will love the visual ness of the quadruped slinky as it rolls, sprawls, spills and dances across the stage." The most baffling, creative, unique & Bizarre Act to ever grace these pages, or ever perform anywhere for that matter. It was created by Veniamin in Romania and has been performed on the top Television Shows here and in Europe...Veniamin..has taken this Act to many Countries to perform before audiences everywhere. "I have never seen anything like that before and that was one of the reasons I hired him. An other reason is that the act is most amusing, entertaining and also astonishing. The reaction from the audience was very positive and Veniamin was a big success during his stay with us." "Over 150 artists from 30 countries took part in this Circus World event but as the expression goes, Veniamin, the human slinky, stole the show." 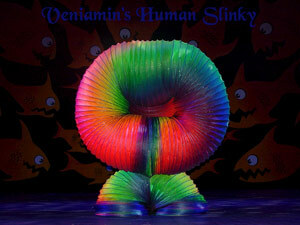 "The human slinky, Veniamin, is a colorful and comical high-energy illusion." "Romanian- born circus performer Veniamin Oprea is always a crowd favorite in the guise of his alter ego, the incredibly flexible Human Slinky."